As we enter a new plan year, we’d like to give you an update of what’s to come as we continue our efforts to make sure the Public Employee Benefits Board (PEBB) maintains quality affordable benefits. Healthcare is incredibly important and a key part of our total compensation. We are starting off this year on a positive note. Our PEBB reserves are healthy, which allows us to continue using our health dollars wisely. More than half of PEBB members are enrolled in self-insured plans, a program that saves millions on administrative costs. We also saw more migration to lower cost plans during open enrollment. We are excited by these developments and enter 2018 in a strong position to stretch our health dollars further. In 2018 we are excited to begin a conversation about expanded mental health services. While we’ve improved mental health plans in the past couple of years — SEIU members do not pay more for mental health visits than other doctor’s visits — we still have a long way to go to make sure access issues are addressed. Depression and anxiety rank high among chronic conditions for our population, and we look forward to considering initiatives in 2018 aimed at getting more PEBB members access to mental health services. We have also begun the renewal discussion for our Employee Assistance Program and want to take a moment to remind you of this benefit . The EAP offers free counseling as well as resources such as putting together a will, homeowners assistance, helping you navigate child and elder care resources, and more. We know people often think that PEBB only covers health insurance, but that’s just the start. More information about other benefits is available here. Despite the smart management of PEBB in recent years, we expect our healthcare benefits to be the subject of political attacks in the February legislative session. 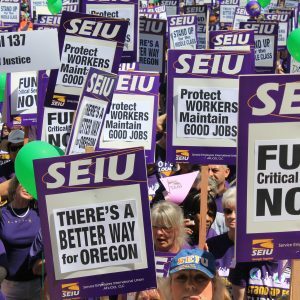 There remains a small group of legislators and pundits in the media who believe that Oregon should balance its budget on the backs of its public employees. Their position is motivated by the desire to keep our corporate taxes lowest in the nation, which puts pressure on the budget and leads to calls for cuts. We bring this up now, given that every time we enter a legislative session, we see attacks on our benefits and can expect that to happen this February. While none of the PERS attacks prevailed in the last legislative session, we did see a cut to PEBB benefits. Senate Bill 1067 cut double coverage for couples who are both employed through a PEBB employer or a PEBB and OEBB (Oregon Education Benefit Board) employer. This change goes into effect in 2020. We will begin moving a bill during the February short session to block this change, but it’s unlikely that we will see a vote on our bill until the 2019 session. Another issue in the February short session is the proposed merger of the PEBB and OEBB boards. This issue matters because SEIU members need to make sure that our voice on these boards is not diluted. We also believe that PEBB benefits, which are more generous than OEBB benefits, may be at risk if the entities merge. SEIU member, and PEBB representative Shaun Parkman has led this fight. Our recommendation to the legislature is that PEBB and OEBB should not merge. Instead, we propose creating an innovation committee that will work to find opportunities for PEBB and OEBB to work together on cost savings that minimize impact member benefits. We expect the legislature to act on this recommendation in February. Through our union’s strong political voice in Salem, we expect to stop any attacks on our retirement or healthcare plans that are introduced in February. One last update. We’ve had some questions about the Jan. 23rd special election around health care and how it impacts PEBB costs. As stated in the ballot measure language, PEBB is included in the healthcare assessment. The assessment for us is minimal and was not passed on to you. 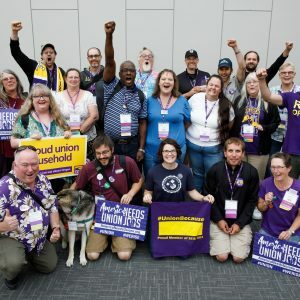 After the legislature passed this bill to ensure Medicaid/Oregon Health Plan funding for almost 1 million Oregonians in the spring, we voted this summer to pay for that assessment out of reserves, which means no SEIU member will see higher costs. The deadline to vote on Measure 101 is January 23. 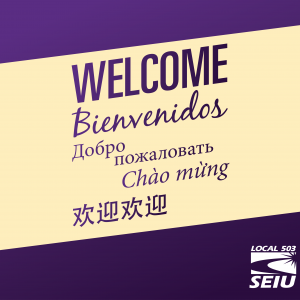 If you have questions or thoughts for us, please email us at pebbreps@seiu503.org.